After a full weekend of wintery fun, it’s nice to arrive at Sunday afternoon. Today will be nice and relaxed. Leftovers for lunch. Movie tonight. Phew. 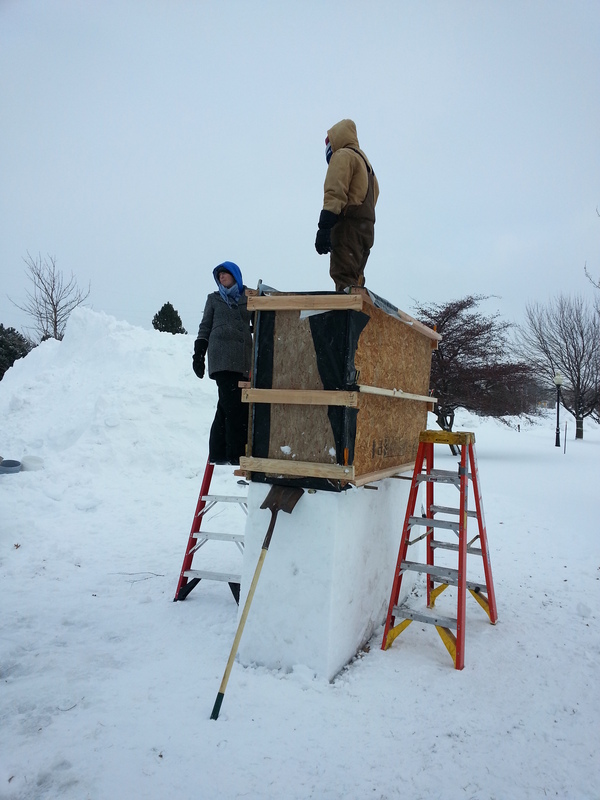 This weekend, we started a snow sculpture with some friends. Yesterday’s task: Build a wall, 2 ft x 8ft, and 10 ft tall. It’s harder than it sounds! We used to 2×4 and OSB to help us form the blocks. After our day out in the cold, we headed to Short’s Brewery in Bellaire, MI, to hear The Accidentals. I highly recommend both. During the month of January, a lot of people start new diets or cleanses to purge their systems of the over-eating many of us do during the holidays. Coach Calorie offers a refreshing take on responding to dietary slip-ups. Speaking of, we’ve arrived at the end of January. Many of our ambitiously set goals, resolutions, and intentions are no longer new and shiny, and may have been put on the back burner. Here are some tips for staying on track–or getting back on track–with your self-improvement goals. Four ingredient peanut butter cookies. I can’t wait to try these. I adore space saving and organizing tools. All the better if they’re functional AND beautiful. Check out this list of 33 insanely clever things to help you organize in a small space. I can’t wait to try this recipe for Szechuan Beef and Broccoli from Elizabeth’s Home. It’ll be on next week’s menu, for sure.